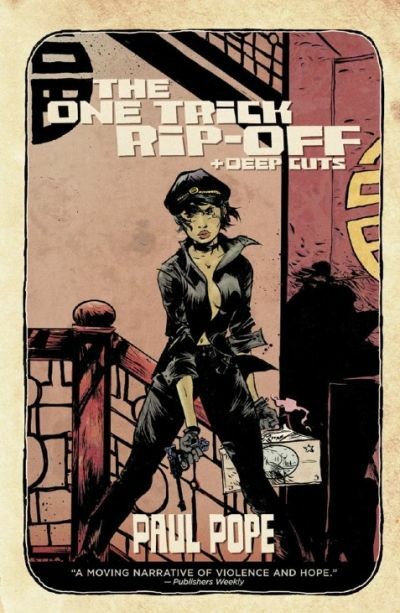 The formative years of Paul Pope‘s development into a world-renowned artist are on display in the new Image Comics collection THE ONE TRICK RIP-OFF/DEEP CUTS. The collection spans his early days as part of a network of self-published artists who didn’t fit in either the mainstream or the underground, to his stint in Japan as a budding manga-ka, to his triumphant return to American comics. The 288-page hardcover collection, with an introduction by the Comic Book Legal Defense Fund’s Charles Brownstein, will also have a limited signed-and-numbered edition. The first half of the collection is the story “The One Trick Rip-Off” that was originally serialized in Dark Horse Presents in 1995-1996, updated with colors by Jamie Grant and Dominic Regan. In a heat-drenched Los Angeles, gangs with names like “The Paid-in-Spades,” “The Moolah Muthas” and, of course, “The One Tricks” battle for dominance with each other - and within their ranks. Tubby and Vim are in love and want escape, but they only way they know how is what they’ve learned in their world. So they set themselves up to be thieves stealing from thieves. And if they fail, it’s the end. A ‘nineties West Side Story, with a touch of the surreal and supernatural, “The One Trick Rip-Off” represents, to Pope, a portrait of sorts of himself as a young artist. The “Deep Cuts” half of the collection is a remarkably diverse, probing, and experimental set of short comics. There are illustrations of Rimbaud’s poetry and ancient Greek tragedy; manga about curry-eating, troublemaking teenage girls; and paeans to love and sensuality and city life. These stories were created between 1993 and 2001, a period that took Pope from Columbus to Toronto to Tokyo and finally to New York City.